Welcome to the Office of Institutional Effectiveness (IE)! Our mission is to promote and support informed decision-making and continuous quality enhancement at Oakwood University. Directs and supports ongoing, integrated, and institution-wide research-based planning and evaluation. Provides qualitative and quantitative information through accessing, collecting and analyzing data. Serves as campus liaison for accreditation issues. Oakwood University is accredited by the Southern Association of Colleges and Schools Commission on Colleges to award associate, baccalaureate, and masters degrees. Contact the Southern Association of Colleges and Schools Commission on Colleges at 1866 Southern Lane, Decatur, Georgia 30033-4097 or call 404-679-4500 for questions about the accreditation of Oakwood University. The Commission is to be contacted only if there is evidence that appears to support significant noncompliance by Oakwood University with a requirement or standard. Oakwood University is accredited by the Adventist Accrediting Association of the Department of Education of the General Conference of Seventh-day Adventists. Accreditation documents may be viewed in the office of the Vice President for Academic Administration. Oakwood University is committed to providing equal opportunity for all qualified persons. It does not discriminate on the basis of race, color, national or ethnic origin, gender, marital status, or handicap in the administration of its educational and admissions policies, financial affairs, employment policies and programs, student life and services, or any other college-administered program. Present and previous university bulletins. 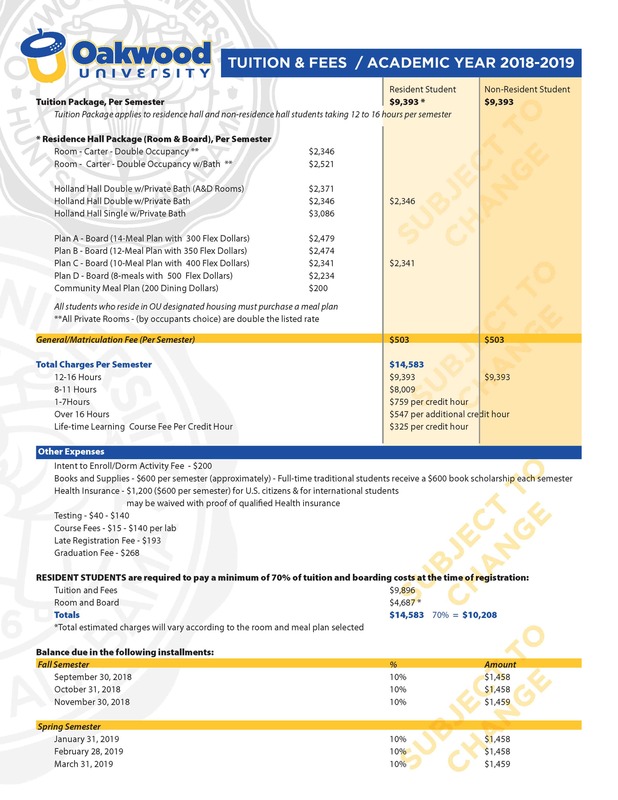 The document posted below is an update of the work of the Oakwood University Strategic Planning Committee. We welcome feedback from interested stakeholders regarding this document. Please take advantage of this opportunity to review and comment on the work of the committee. Thank you for your participation. The Oakwood University Strategic Planning Committee is in the process of preparing a new strategic plan. It is important for the committee to have input from all of its stakeholders. This website has been developed for two purposes: first, to provide information to constituents about progress in the strategic planning process and second, to solicit feedback from constituents regarding the information provided. As the committee makes progress, documents will be posted here for review and discussion. An institution’s strategic plan projects its character and image. It communicates its mission, goals, and objectives. It is the organization’s blueprint for utilizing its skills and resources, directing its routine operations, and achieving its dreams and aspirations. It is its portrayal of its future, organized by distinct, determined actions for achieving a specified set of outcomes in keeping with the mission of the institution. The purpose of this strategic plan is to unite all of the institution’s component parts around a set of common goals and institutional priorities. It is designed to serve as a linking device to connect the various categories of decision-making and action within the institution. It is also structured to encourage integration and collaboration among campus entities. The process used in developing this plan included both internal reasoned projection and external environmental scanning. The University Strategic Planning Committee determined the process to be followed. The consultant services of Dr. Paul Brantley were procured to complete the environmental scan and provide recommendations (see Appendix). The university mission statement and goals went through two years of review and revision. Annual effectiveness reports completed by the Institutional Effectiveness Committee provided assessment results to support decision-making. Participation was broad-based, including representatives from campus and constituent bodies: faculty, staff, students, administrators, trustees, community members, and external consultants.